There’s been a lot of blank disbelief on the blogosphere of late, due to the announcement of a conference on Geocentrism (Galileo was Wrong). Geocentrism is the belief that Earth is the centre of the Universe and everything revolves around it. You would think that, 400+ years after Galileo, people would have cottoned on the the idea that the Earth orbits the sun, the sun orbits the galactic centre and the Milky Way galaxy does … well …complicated stuff with other galaxies, but basically we worked out long ago that the Earth is not the centre of the solar system, let alone the Universe. Other people, especially Ethan at Starts with a Bang and the Bad Astronomer, have dealt with the technical details (and I have an earlier discussion here and here). My goal is to get you, the ordinary person on the Clapham omnibus (or in my case, the Outer Harbour train, where I am writing this), to try and demonstrate the Earth is heliocentric for yourself and to do so with common household materials. After all, science is at heart a practical endeavour, and non-professionals should be able to find the evidence for themselves. So for this journey into the starry spheres, we will need a pair of binoculars, a camera tripod, some cardboard and alfoil, and lots of gaffer tape. We also have some luck, as the sky is currently cooperating in the Geocentrism debunking stakes. First we have to ask ourselves, which “geocentric” theory are we disproving. The classic geocentric theory is that of Ptolemy, in which the planets, Moon and the Sun all orbit the Earth. The most famous variant of this is Tycho Brahe’s helio-geocentric system, where the Sun and Moon orbits the earth and everything else orbits the Sun. There are important differences in the systems which we will explore later. First off, let’s look at the phases of Venus. For this you will need binoculars and the camera tripod. You will also need a way of attaching the binoculars to the tripod. These days I use a special attachment (but this requires modern binoculars that have a screw thread on the body), but in the past I have used gaffer tape to good effect. Why attach the binoculars to the tripod? Because otherwise there will be too much shaking for you to see the image properly. The image to the left is the setup I use for observing Sunspots (we come to that later), showing the binoculars gaffer taped to the tripod. 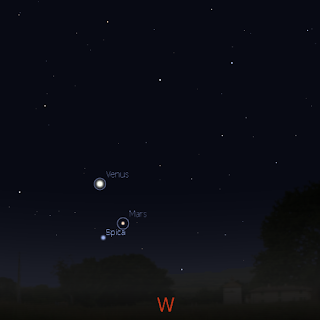 At the moment, Venus is prominent above the western horizon. Point your binocular lash-up at Venus, in my 10x50 binoculars Venus is very small but is a disk which has a distinct “half -Moon” shape. 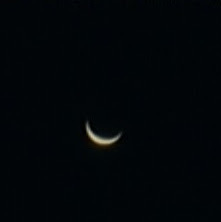 If your binoculars don’t have decent anti-glare coatings, you may have to observe in the early twilight in order to see Venus’s shape without internal reflections from the binocular lenses getting in the way. As you watch over the coming weeks, you will see Venus expand in size and become more crescent- shaped. Sketch the shape so you can follow its progress. This is so fast you should see a visible change in just one week. By mid-October Venus will be a thin crescent almost 2/3rds bigger than when you started observing. By late October Venus has nearly doubled in size and is a thin, glistening wire. Then Venus vanishes into the Suns glare and reappears in the morning. Over the next few months you can watch Venus shrink and become a tiny disk. And now you have demolished the Ptolemaic geocentric system. Venus does have phases in this system, but quite unlike what you see here (I leave it too the reader to work out what a Ptolemaic systems Venus phases would look like, you can see a model of Ptolemaic Mercury here, which will give you a good idea). And you have only taken almost 6 months to do it (what, you thought it would be easy). As a reward, here’s an animation of the Phases of Venus. Left image Jupiter above the eastern horizon, Right Image, Venus above the western horizon, both at the same time in the evening (around 8pm ish in mid September 2010). But wait! You say What if it is just an illusion, a trick of the optics? Well, you have a control. 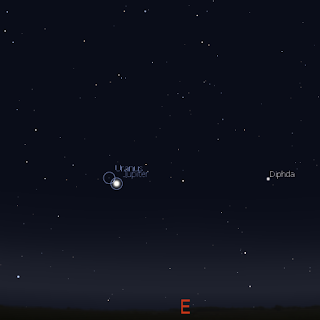 Having observed Venus, swing your binocular lash-up to the east, to the brightest object there (and second brightest non-lunar object in the night sky after Venus), Jupiter. Jupiter is a distinct oval in my binoculars, and the four bright Medicean Stars glitter around it. Over the nights you watch Venus swell and thin, keep an eye on Jupiter as it does…well…nothing. Jupiter and three of its moons imaged with a mobile phone. But Ah! The Medicean Stars, now known as the Galilean Moons, they will shuttle backwards and forwards during the nights as you watch. The realisation that these “stars” were Moons of Jupiter were not a blow to any form of geocentrism per se, although they were the second of a series of powerful blows against the Aristotelian physics that underpinned Ptolemy’s system, which aided its demise. Determining that these specs actually orbited Jupiter, and were not just accidentally there, took a lot of effort. Try keeping track of these sparks, and without reference to an almanac, try and determine their orbits (heck, try and keep track of which near identical points of light are which). It may take a while, you will need to keep careful sketches, and track the Moons and Jupiter with respect to the stars as Jupiter moves through the heavens, but a) You are sketching Venus anyway and b) it will be well worth it (hey, you proving things for yourself!). The next bit is more demanding. The Phases of Venus demolished the Ptolemaic Geocentric system, but the Tychonian- Geo-heliocentric system had Venus phases just like a pure heliocentric system (which is not surprising, as Tycho’s system is an inverted Copernican system). 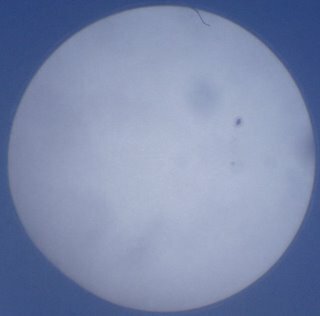 To eliminate the Tychonian system, we need to observe sunspots. Luckily the Sun is coming out of its quiet phase, so you will have some to record. 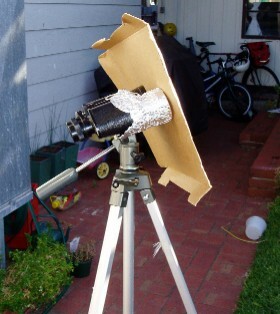 For this you will need to set up a safe binocular projection system (as shown above), where the image of the Sun is projected onto a surface so you can record the Sunspots. NEVER LOOK DIRECTLY AT THE SUN WITH BINOCULARS AS SEVERE EYE DAMAGE WILL RESULT. Anyway, while you are recording the Phases of Venus and the orbits of Jupiters’ Moons, record the passage of Sunspots over the Suns face, over the 5-6 months you are recording the Sunspots, you will notice the path taken by the sunspots moves up and down. This is due to the Earths orbit not being exactly in the plane of the Suns rotation. In a geocentric system, with the Sun orbiting the earth once a day, this variation would show up on a daily basis, but what you observe can only be seen in a heliocentric system. So, congratulations, you have just demonstrated that geocentric models don’t describe the solar system we see using very simple tools. It took a while, and was hard work, but you have demonstrated it yourself, and all the blovation of geocentricists won’t take that away (yes, Stellar parallax gets all the glory, but annual Sunspot variation was a powerful blow to Tychonian geocentric models). If you want to, you can take this further by making your own Foucault’s Pendulum.